Here are two more little flounder doodles which I make during the spare moments of the day. The one at the top is a garden flounder which makes me think of spring…but with some sort of automated gardening machine that looks like a bug sitting atop of it. Below is a post-apocalyptic fluke in the middle of the desert badlands of the grim future. I have no idea what it means. Maybe these have something to do with that perplexing German flounder fable about what we really want. Alfred Kubin was born in Bohemia in 1877 (Bohemia was then part of the Austro-Hungarian Empire). Like many people, Kubin could see the direction which Austrian society was taking, and it seemed to rob him of direction. As a teenager he tried to learn photography for four pointless years from 1892 until 1896. He unsuccessfully attempted suicide on his mother’s grave. He enlisted and was promptly drummed out of the Austrian army. He joined various art schools and left without finishing. Then, in Munich, Kubin saw the works of symbolist and expressionist artists Odilon Redon, Max Klinger, Edvard Munch, and Félicien Rops. His life was changed—he devoted himself to making haunting art in the same vein. His exquisite mezzotint prints are full dream monsters, spirit animals, ghosts and victims. These dark works seemed to presage the era which followed. Yet throughout the nightmare of both World Wars and the post-war reconstruction, Kubin lived in relative isolation in a small castle. After Anschluss in 1938, Kubin’s work was labeled degenerate, yet his age and his hermit life protected him and he continued working through the war and until his death in 1958. In later life he was lionized as an artist who never submitted to the Nazis (although possibly he was too absorbed in his own dark world to notice the even darker one outside). Kubin’s beautiful prints look like the illustrations of a children’s book where dark magical entities broke into the story and killed all of the characters and made their haunted spirits perform the same pointless rituals again and again. Great dark monuments loom over the lost undead. Death and the maiden appear repeatedly, donning their roles in increasingly abstract guise until it is unclear which is which. My favorite aspect of the works are the shadow monsters and hybrid animals which often seem to have more personality and weight than the little albescent people they prey upon. The gloomy ink work is so heavy it seems to lack pen strokes—as though Kubin rendered these little vignettes from dark mist. Kubin’s imagery was naturally seen through the psychosexual lens of Freudianism. He was claimed by the symbolists, and the expressionists. Yet his work seems to really exist in its own mysterious context. Kubin’s greatest works seem to involve a narrative which the viewer does not know, yet the outlines of which are instantly recognizable (like certain recurring nightmares). In a long-ago post, Ferrebeekeeper wrote about the Ordovician–the age of mollusks–when big predatory cephalopods and gastropods overtopped nascent vertebrates as the apex predators of the world oceans. Cephalopods are fiercely intelligent, incredibly fast, and astonishing at camouflage. They can be infinitesimally small or remarkably large. They can even be transparent. However they don’t last well—they are squishy and even if they aren’t eaten they have very short lives. One of the most vivid memories of my adolescence was watching cuttlefish hover and change colors and feed with bullet-fast grabber arms at the National Zoo. The memory comes with a dark post-script. I returned a few months later with friends, only to find that the cuttlefish had entered a bizarre unnatural senescence and were literally falling apart at the seams. They do not die of old age in the ocean; something always eats them. But this is no longer the lovely Holocene with its oceans full of fish and skies full of birds. We have entered the Anthropocene—an age of hot acid oceans filled with Japanese trawlers bent on catching every last fish in the sea by means of nets the size of Rhode Island. Suddenly it is not so beneficial to be a big bony ancient fish with hard scales and sharp teeth. The teleosts and the cartilaginous fish are being physically pulled out of the ocean by humans. It takes them too long to reproduce and rebuild their numbers (even as national governments subsidize fishermen to build more and larger fishing boats). The age of fish—which has lasted from the Devonian (420 million years ago) until now—is ending. So a new scramble to exploit the great open niches in the seas is beginning. Unexpected life forms are flourishing. The sea floors are filling up with lobsters, which have not been so prevalent in a long time. Giant jellyfish are appearing in never-before-seen numbers. However it is beginning to seem like the greatest beneficiaries may be the cephalopods. Mollusks with shells are having their own troubles–as the carbonic acid oceans eat at their calcium shells, but the octopus, squid, and cuttlefish have no such problems. Not only are they well suited for tropical waters, they rcan also reproduce so fast that they can keep ahead of human’s bottomless appetite. A single squid egg cluster can have millions of eggs inside. Cephalopods tend to be generalists—they eat all sorts of things including booming micro-invertebrates and jellyfish. They are clever enough and malleable enough to slip out of all sorts of hazards. Their swift lives are a boon. Because they reproduce so quickly and prolifically, they evolve quickly too—a necessity in our 24 hour world (as all sorts of out-of-work journalists, lamp lighters, factory workers, and saddlemakers could tell you). I wonder if in a few million years the waters will glow with great shoals of exotic tentacle beasts we have scarcely imagined. Will there be fast marlin-type squids with rapiers on their mantles and huge whale-shark type octopuses skimming the phytoplankton with their own giant nets? Will the skies darken with flying squids and the sea floor change colors as tens of thousands of cuttlefish take the roles of reef fish and reef alike? It is possible. The world is changing faster than we would like to admit—becoming something brand new—becoming something very old. Remember back when it was February and the world was a tattered veil of gray misery? Well now it is glorious May, and it is hard to recall those dark times. The birds are singing. The flowers are blooming. Shepherdesses float through Wall Street dressed in summer frocks. Fortunately we have poetry to keep us ever mindful of the darkness & perfidy of the world. Below is the May installment of Shepheardes Calender: the poem starts out gloriously with exquisite descriptions of Arcadian revels. There could hardly be a more sumptuous evocation of spring in the country. If you cannot smell the blooming flowers and hear the songs of the happy youths, then your heart is devoid of pastoral poetry. But then Spenser starts in with the animal metaphors and we sense that even in May we are not in a Disney movie. First we have the ape which loves her baby so much that she throttles it by hugging it. Then there is the parable of the young kid who ignores his nanny goat’s stern warnings and opens up his door to the crafty fox..who has come dressed as a pathetic salesman. This story has all sorts of double meanings, but right now there are so many foxes at the door it is hard to know what to make of it. Spenser lived in England, where commerce rules…and he died penniless, so perhaps there is a lesson about business and businesspeople from the sly merchant fox. Yet, even if this segment ends with a dark fable, there are many delights to be had herein. Besides all of this sorry business about barely disguised tricksters lying and manipulating a gullible audience in order to make a meal of them couldn’t be valid in contemporary America…could it? When Love-Lads masken in fresh Array? Ylike as others, girt in gawdy Green? With green Leaves, the Bushes with blossoming Buds. And Girlonds of Roses, and Sops in Wine. But we here sitten as drown’d in a Dream. But we tway been Men of elder Wit. Whereto they dauncen each one with his Maid. Made my Heart after the Pipe to daunce. How great Sport they gainen with little Swink? In Lustihed, and wanton Merriment. That playen while their Flocks be unfed. That letten them run at random alone. And get all the Gain, paying but a Piece. When great Pan Account of Shepherds shall ask. All for thou lackest some dele their Delight. But scorned been Deeds of fond Foolery. The while they here liven at ease and leisure? But what they left behind them, is lost. God giveth Good for none other end. Who touches Pitch, mote needs be defil’d. Mought not live ylike, as Men of the Lay. And to continue their wont Countenance. Sike worldly Sovenance he must fore-say. To leave enriched with that he hath spar’d? Eke cherish his Child, if in his ways he stood? All will be soon wasted with Misgovernance. The Floods whereof shall them overflow. She stoppeth the Breath of her Youngling. Evil ensueth of wrong Intent. (Were it more or less) which they did keep. And little them served for their Maintenance. And their Flocks Fleeces them to array. Lovers of Lordships, and Troublers of States. And leave to live hard, and learn to lig soft. And often the Shepherd that did hem keep. That now nill be quit with bale, nor borrow. But the fourth to forbear, is outrageous. With Patience to forbear the offer’d Boul? Most is, a Fool’s Talk to bear and to hear. That bears on his Shoulders the Heaven’s Height. And blamest hem much, for small Encheason. How woulden Shepherds live, if not so? What, should they pinen in Pain and Woe? If I may rest, I nill live in Sorrow. For he will come without calling anon. We mought with our Shoulders bear off the sharp Showres. The while their Foes done each of hem scorn. So Conteck soon by Concord mought be ended. Had lever my Foe, than my Friend he be. For what Concord hen light and dark sam? Or what Peace has the Lion with the Lamb? Will do, as did the Fox by the Kid. For the Lad can keep both our Flocks from straying. Was too very foolish and unwise. And full of Favour, as Kid mought be. And sprung forth rankly under his Chin. And send thee Joy of thy Jollity. How would he have joyed at this sweet Sight? Betraying him unto the Trains of his Foe. And flourish in Flowers of Lustihead. And so his haughty Horns did he weld. The old Lineaments of his Father’s Grace. And ‘gan his new-budded Beard to stroke. For he has vowed thy last Confusion. Spar the Yate fast, for fear of Fraud. Open the Door at his Request. That answered his Mother, All should be done. And Kiddy the Door sparred after her fast. But the false Fox came to the Door anone. For in his Head-piece he felt a sore Pain. For with great Cold he had got the Gout. And laid him down, and groaned, alack! alack! That some good body would once pity me. For deceitful Meaning is double-eyed. That in my Carrion Carcass abounds. And also who, and whence that he were. But I be relieved by your beastly-head. For with longer Travel I am brent in the Sun. The base Kinred of so simple Swain. With your Aid to forestall my near Decay. That nought he deemed dear for the Jewel. The false Fox, as he were stark lame. Lest he should be descryed by his Train. All for the Love of the Glass he did see. And how he could shew many a fine knack. In the Basket, for the Kid to find. But ran away with him in all haste. She mought see the Door stand open wide. Her Kid: but he nould answer at all. Of which her Son had set too dear a Price. She weeped and wailed, and made great moan. That of such Falsers Friendship been fain. Furthest fro the Mark, weening it to hit. For well he means, but little can say. Much needeth all Shepherds hem to know. I hold it best for us home to hie. Tis d’ ara pistis apisto. Today brings interesting color themed news from outer space. The Messenger space craft (which was destroyed when it was deliberately crashed into Mercury in spring of 2015) spotted numerous mysterious dark spots on Mercury. Indeed the Messenger spacecraft probably now is a dark spot on Mercury. Apparently the small dense planet has a dark layer close beneath the surface. Asteroid impacts, volcanoes, space probe collisions, and other events which disturb the surface of the planet reveal this extremely dark black/gray layer. Scientists have been analyzing the data from Messenger and it now seems that this black layer which is the color and texture of pencil lead is actually composed of…graphite, the same material as pencil lead! Apparently when Mercury formed (which featured strange geological processes unseen anywhere else in the solar system) a planet-sized ocean of lava covered the entire world. As Mercury cooled the heavier elements of this lava field crystallized and sank leaving the buoyant pure carbon at the top. This dark layer has been subsequently covered with ejecta, dust, and fragments, but any disruption shows the crystallized carbon is still there. There is a lot more data from Messenger left to analyze. I wonder what other surprises the closest planet to the sun still holds. 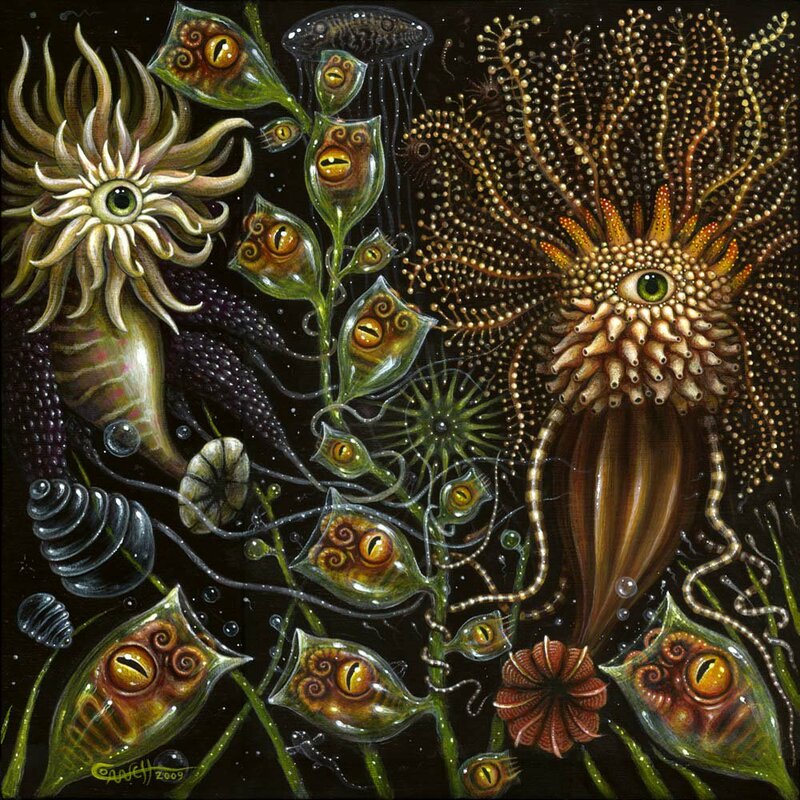 Here is an amazing painting of fantastic glistening underworld creatures. I greatly admire the artist, Robert Steven Connett, a self-taught contemporary painter who crafts baroque landscapes of dark lifeforms and gleaming spirit-things. At their best his works come together to portray life as an interwoven web of symbiotic appetite and need—a phantasmagorical ecosystem of amalgamation and ingestion. It is as though Giger were a gifted mycologist or invertebrate zoologist. As far as I can tell, Connett has made few inroads in reality, where art is controlled by a click obsessed with fatuous celebrity and tiresome naval-gazing deconstructionism. However he has created his own strange markets online (in much the same way that he builds his own imaginary underworld ecosystems). It almost gives a person hope. I realize this has been an art-heavy week…but I will make it up to you next week when, in celebration of Halloween, we have a whole week dedicated to a unifying theme of macabre terror. The Halloween themes of years past–the children of Echidna, the Flowers of the Underworld, even the spiritual and ontological horrors of the undead–raised no eyebrows on the internet, so I am ratcheting up the dreadful violence this year. Steel yourself for the frightful flesh-cutting terror…uh, and for more art too I guess. 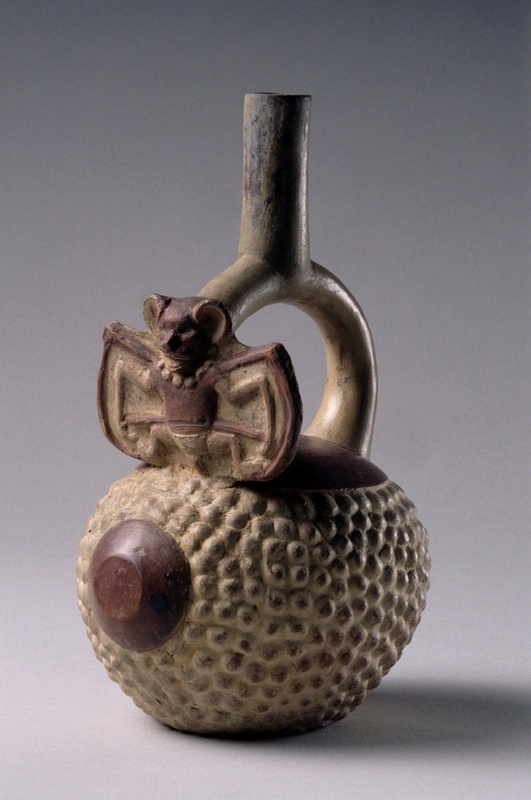 Longtime readers will remember that Ferrebeekeeper has a great fondness for the magnificent art and pottery of the Moche, a civilization noted for sophisticated agriculture, ultra-violence, and, um, magnificent art and pottery. 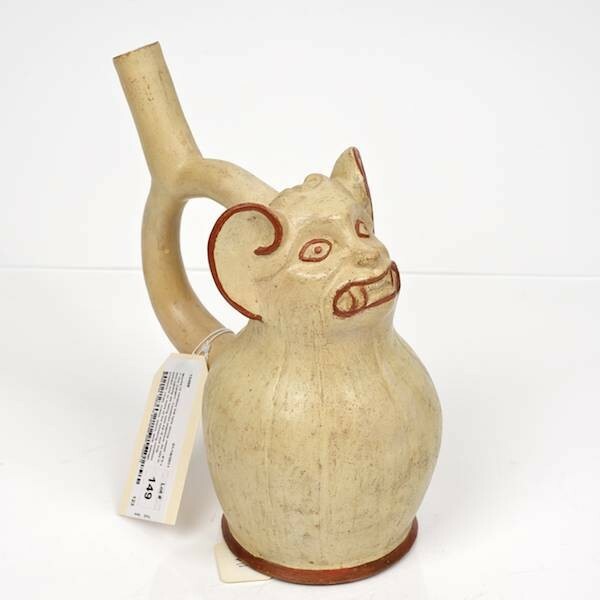 The Moche lived in the rich coastal lands of what is now northern Peru. In the past we have written about their art of sea monsters and human sacrifice, and of waterfowl. 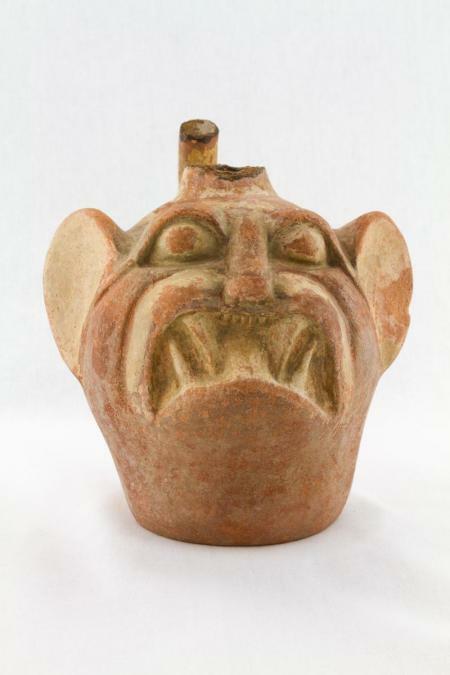 Today we look at Moche bat-themed art. 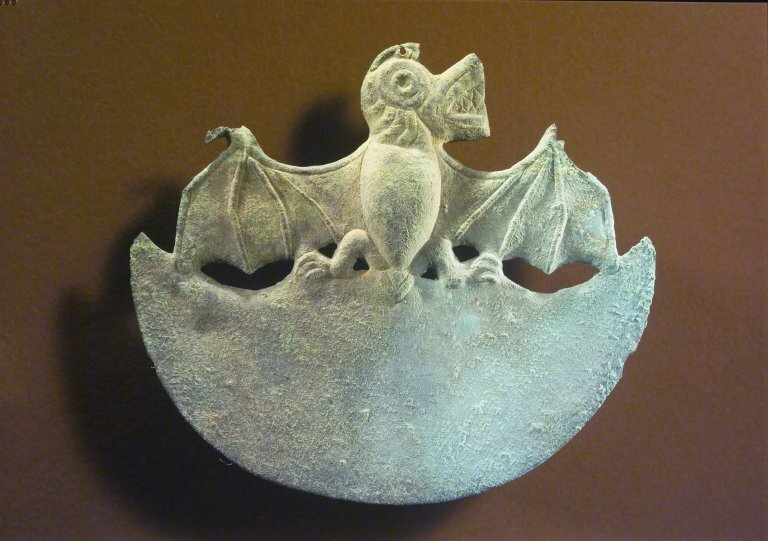 Bats were beloved subjects of much pre-Colombian art (I owe everyone a post about the bat in Aztec art and myth). 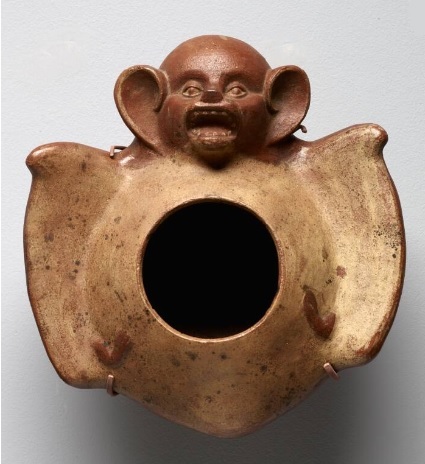 Although they were great artists, the Moche were scary people who were always sacrificing and garroting and flaying (more about that next week) and excarnating and hanging corpses everywhere. 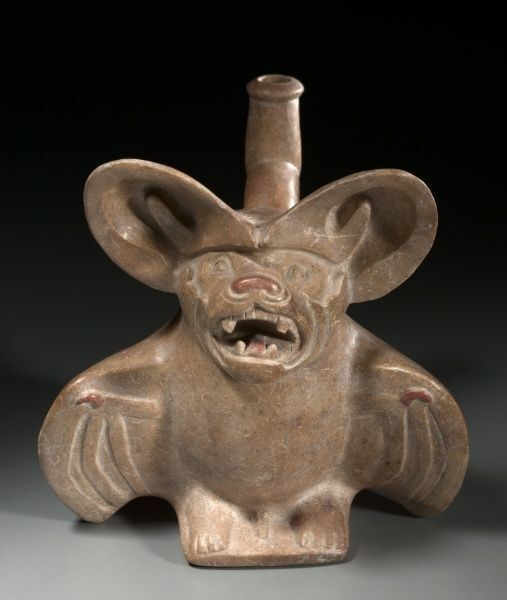 Yeesh… Perhaps unsurprisingly, the bats of Moche art are scary creatures with grimacing monster teeth and near-human expressions of malice and grief. 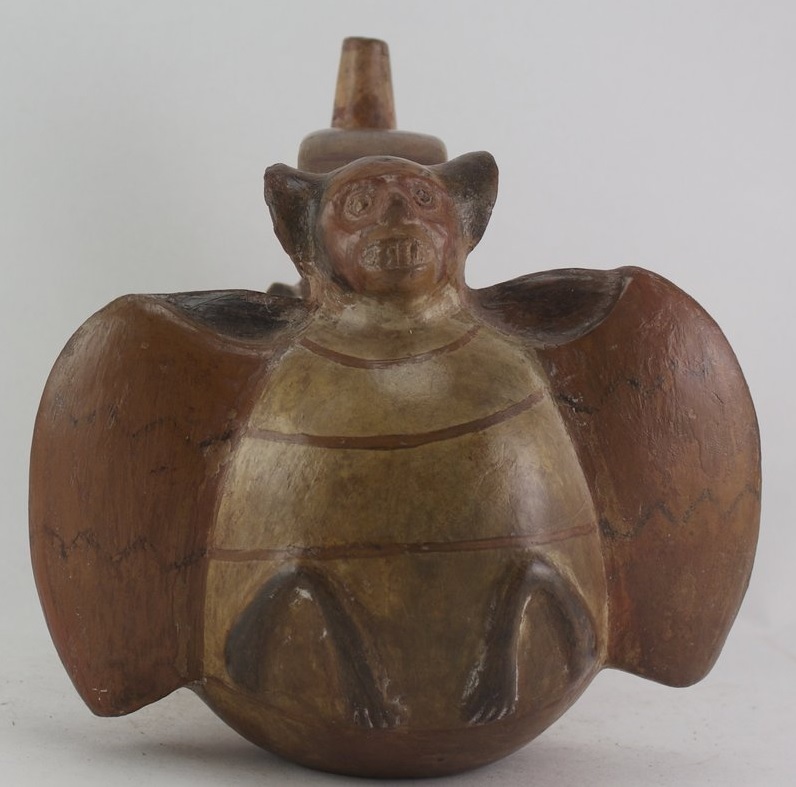 Sadly we don’t know precisely what place the bat held in Moche mythology. In fact we don’t know anything about Moche mythology except what we can intuit visually. 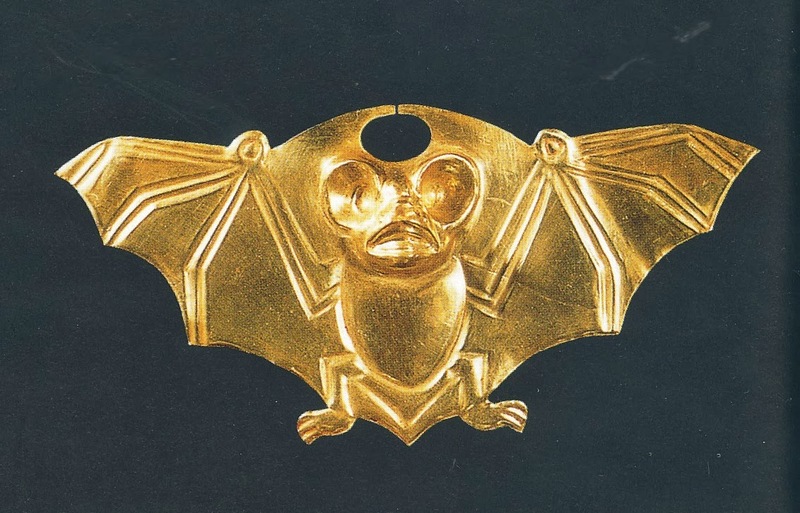 However there are lots of bats to visually interpret and it seems like a safe bet that they had a chthonic underworld meaning (as they do in Western art and culture). These bats are demons and monsters born of the dark night-side of the human spirit. 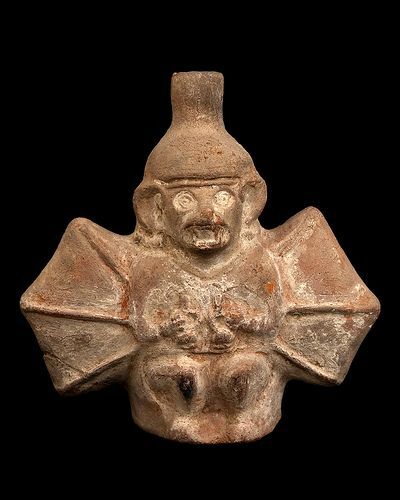 All of these grimacing fanged bats with bared claws and anguished eyes make me think of the Moche people themselves—caught up in their centuries-long game of bloody worship and savage status. I wish I could help them, or even understand them, but they are gone. All we have are their skeletons and their beautiful dark art. 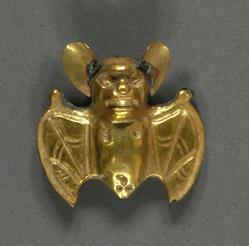 Moche – Pair of Gilt Bat Appliques. Loma Negra, Peru. I was going to write a post about the dwarf planet Ceres–which is currently being explored by the NASA New Horizons robot probe. The more we learn about the failed planetary fragment, the more enigmatic it becomes (the little exploded world seems to be covered with giant pyramid-shaped mountains and weird super reflective craters). However I decided to wait to write this Ceres post until August when New Horizons dips closer to the dwarf planet and we get some clear answers (or at least some better photos). Fortunately, as I researched the mysteries of Ceres, I came across the above statue of the goddess Ceres, and it immediately became one of my favorite artworks from classical antiquity (which is saying quite a lot). The statue is Roman from the Augustan period. 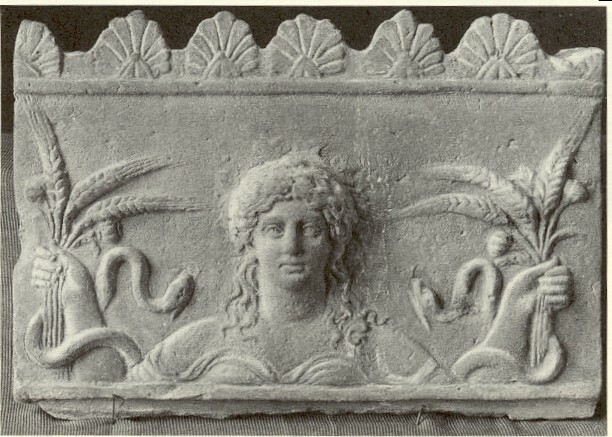 I assume the figure is Ceres (Demeter) but it is possible that it may be her daughter Proserpine (Persephone). Ceres is portrayed as the gentle and munificent goddess of agriculture who is friend to humankind. She is clad in the flowing raiment of a goddess and she holds the bounty of Earth, but her eyes are sad and full of wisdom. Her hands flow with full heads of wheat, but mixed in are the addictive poppies that soothe pain. Beside her two snakes whisper the secrets of the underworld. Agriculture gave us our knowledge and our power, but it also made our world of masters and slaves, and it looks like the goddess recognizes this in her ancient eyes. 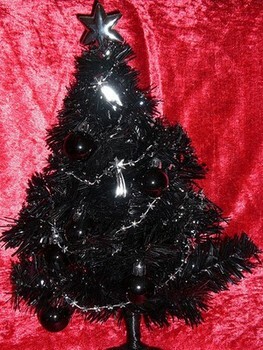 We are coming up on the Yule season and that means ornamental conifers! 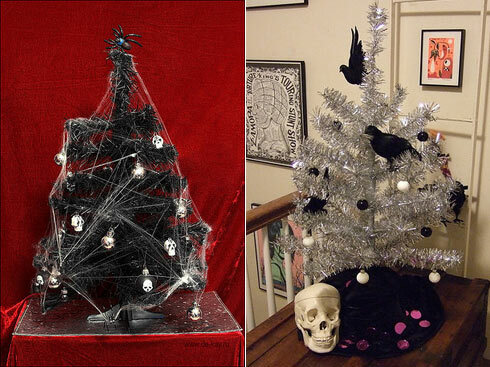 As I was putting up my traditional tree of many animals, it occurred to me to see if there were any spooky Gothic-themed Christmas trees. 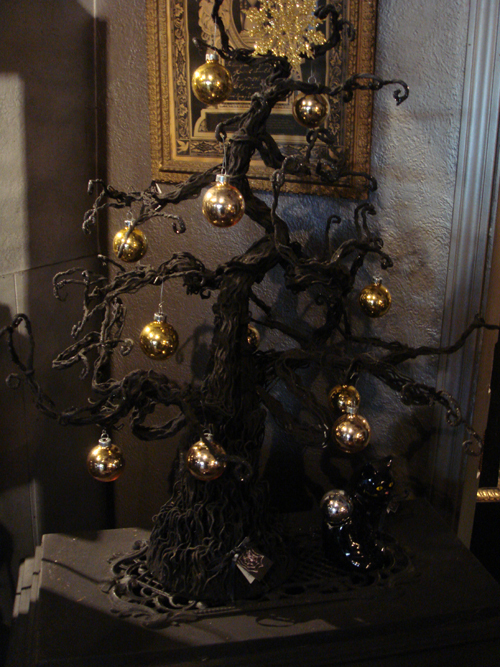 And, oh indeed…there are so many Gothic themed trees and ornaments out there! 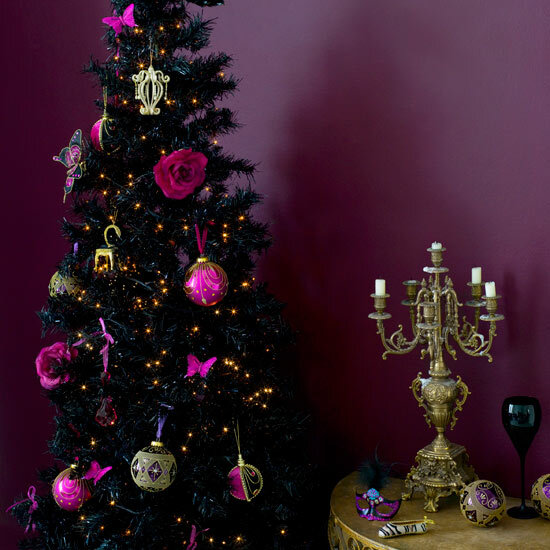 Although at first these dark trees might sit wrongly with traditionally minded revelers, a moment of thought will reveal that Gothic trees are quite appropriate! 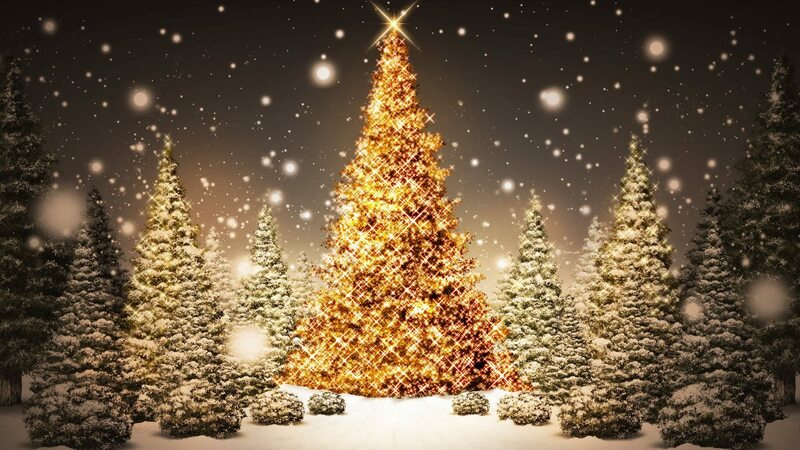 Not only is the Christmas tree an ornament for the darkest & hardest time of year (Winter Solstice) it is also an ancient relic of pre-Christian Europe when pagan folk venerated trees. 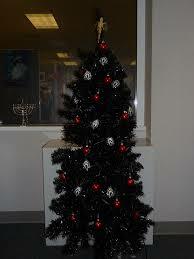 Furthermore the idea of Christmas trees, like the ancient Goths themselves, originated in Germany and Scandinavia. For years, pundits have been worrying what happens when marketers put up their Christmas decorations earlier and earlier. Maybe this is what happens: a reversion to druidic darkness. 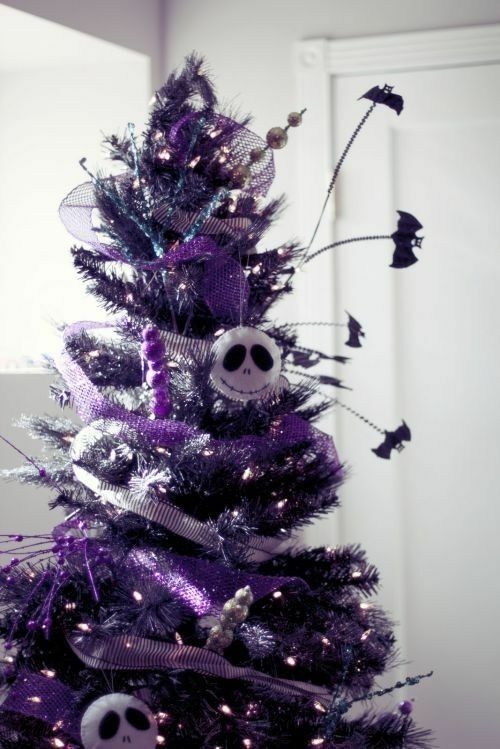 Here are some Gothic trees—some are “goth” in the modern punk rock sense, while others are pagan, macabre, ironically twisted, or just winsomely slender. 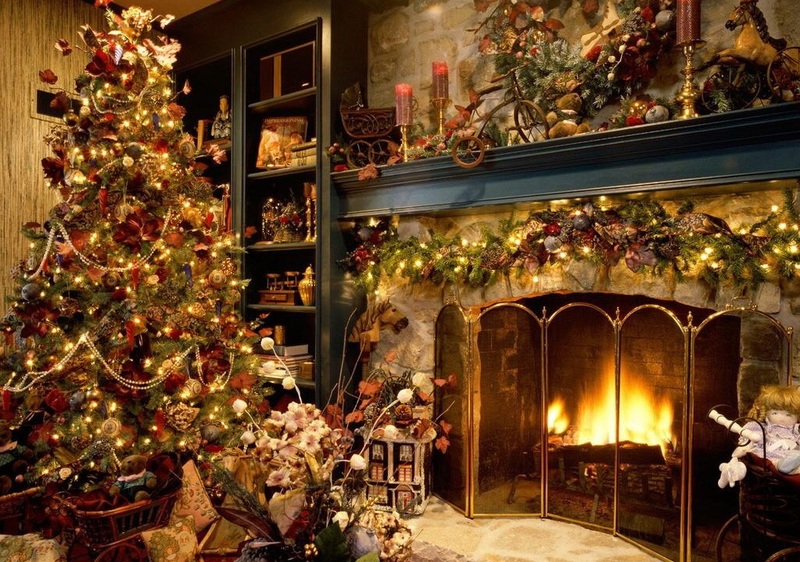 In case this is making you anxious, it’s all in seasonal fun! 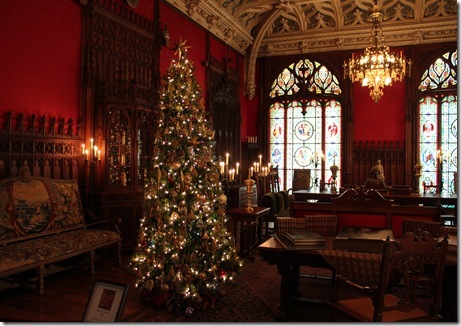 Also I threw in some beautiful Gothic-revival Christmas trees to evoke feelings of Victorian opulence! 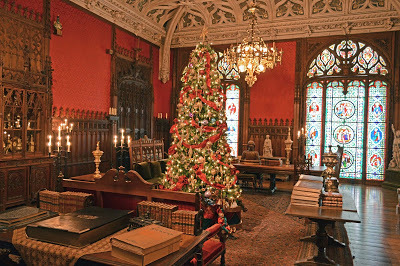 Enjoy the gallery and the holiday season (but don’t worry, we’ll have more appropriate seasonal fare next week). What a cool crystal thing! 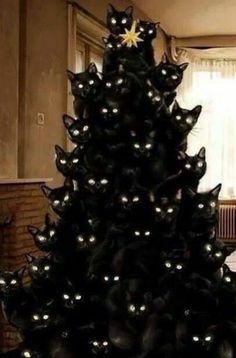 This one might be slightly photoshopped–although cats do love Christmas trees! 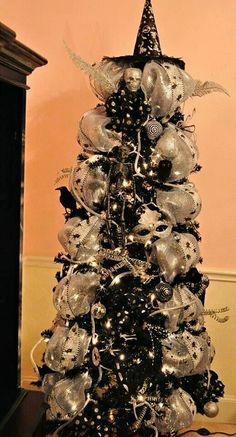 Dammit, there isn’t even a tree in this! Is anyone paying attention? And Here’s a really good one for the dramatic conclusion. 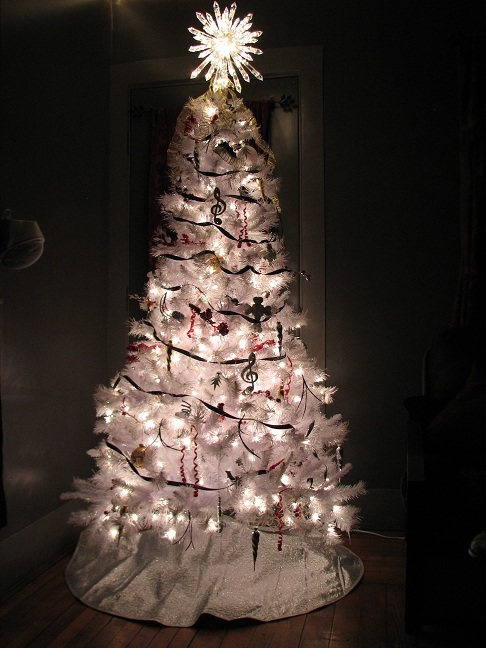 It has a touch of the cosmic–and it’s also a shout-out to tree worshipers everywhere).